Dursley's annual Pancake Race is held on Shrove Tuesday each year. The race is traditionally held in Parsonage Street at 12 noon. Depending on the number of runners who have entered, "heats" are held with the fastest runners qualifying for the grand final. In February 2010, Dursley Town Council resolved to resurrect the annual Pancake Race, and to provide a trophy for the winner. The town's Chamber of Trade used to organise the event, but it had not been held following the demise of the group. Each year a local charity benefits from the entry fees and any other monies raised during the event. The 2019 race was held on 5th March. All proceeds went towards the Henlow Court Activity Fund. 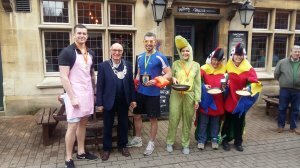 The 2019 Pancake Race was held earlier today with entrants representing local organisations and businesses taking part. A trophy donated by Dursley Business Inclusive, in memory of local volunteer Eileen Nichols, was awarded to Viv Kennedy & Della Sykes, dressed as Parrots. The Town Council would like to thank all the runners who participated and the following organisations and businesses who supported the event including Daisy Belle Floral Design, Dursley Lions and to Classy Glass who very kindly donated trophies and medals for the race. The proceeds of this year's race will be presented to the Henlow Court Activity Fund. Download a copy of the Entry and Sponsorship Form, explaining Race Terms & Conditions, below.